On Feb. 21, 2012, at the age of 56, I had a heart attack. I have no memory of it. I have taken time to ask and listen to the stories others have told me, in order to put together an accurate testimony. It is very evident that God was in control of this entire event. Let me start by explaining that I live in a small rural town. There is no EMS service here. In an emergency, we have to call 911 and they notify the next town. That EMS service sometimes takes 15 min. or more to arrive. We do have first responders who respond within a few minutes. But the emergency transport to a hospital takes longer. Lets begin there. My boyfriend , and I normally have supper together and then watch tv, at 8:00 pm he goes home. This particular evening, he tells me that I asked him to stay a little longer. He agreed and we watched tv for a few more min. ( had he not stayed, I would have been found the next day, dead) Then it happened. He watched me as I turned blue and was nonresponsive. He called 911, and followed the instructions he was given. Remember the EMS? Well it just so happens that they were uptown at a meeting. Yes, uptown, in MY town. They took just a few min. to respond. (God is soo good! he took care of every detail) My boyfriend spent the next few hours making calls to family and friends, my work etc. He has a blog and he began sending out prayer requests on Facebook and his blog. These requests went out to people all over the world. People took the requests to their local churches. I had people as far away as Australia praying for me!!!! He updated his blog and Facebook every day. These wonderful people prayed for me and they didn’t even know me!! Of course I was also receiving prayers from my own church and other friends and family. There were literally thousands of people praying. I was lifeflighted to Parkview Heart institute, where they worked on me. I was in a coma for three days. While I was in a coma, I remember (the only thing I remember) was hearing scripture verses now and then. I’m sure that was my boyfriend, when he was at home he was praying that God would hear and let me hear, and he would repeat certain scriptures over and over. I remember that as I was sitting up, all I could see was a black darkness. Unlike any darkness I have ever seen. If you are in a completely darkened room and close your eyes, you still see something. Kind of like snow or static on a TV set. I guess some people may not know what that reference means. But it’s the only way I know to describe what I’m trying to say. Anyway, this darkness was not like that. There was absolutely NO light, no “snow” or static. All I could see was pure blackness. As I was sitting up I remember I was asking God “but how long?? How long?” It was as though I became aware or at least my memory begins at that point. I then became aware that I was standing and could turn and look at my body, lying on the bed. I was being called by God to step out of my flesh. I began to look for Him. I knew that God is light so I just needed to find the light. So I began to look for the light. I need to note, I had NO FEAR. Fear didn’t exist where I was. Being in the darkness and not seeing a light right away, normally would have cause some fear in me. But there was NONE. I reminded myself that if I didn’t see Him right away (the light) that I just needed to wait. Because he will come. It was then, that I was able to see the tiny pinpoint of light. Way off to my right. It was tiny but as I watched it slowly got larger and larger. I realized that it was coming closer and closer. Finally the light arrived. It was a huge opening, like a doorway. I watched and wondered what should I do? Then I realized, a doorway is to walk through. So I stepped down off the bed and walked to the doorway. I stepped from the darkness, into the light. One detail that I’ve wondered about was, as I stepped out, it was as though I was stepping out of a building. I needed to step down to the ground. I stepped down into a “step” that was a cement cinder block placed there for me. I still am in wonder over this detail. But I was realizing that I was in a place I had never been. I remember seeing the landscape and looking down at the dirt. It was sandy, dry and very fine, powdery, dusty. The texture was very much like talc or baby powder. But a light tan color. I scuffed it with my big toe and watched the dust billow in the breeze. I heard two women, at first they sounded like the were arguing. Then I realized they were just upset, and loudly complaining to each other. I listened for a moment when I began to feel this drawing or pulling felling coming from my chest. It felt like my chest had metal in it somehow and there was a huge magnet pulling at me. I know it sounds weird but that’s my best description of how that felt. I knew that whatever was causing that feeling was coming from the other side of a huge bush or tree. Possibly a very large rose of Sharon? Not sure about that. But the drawing or pulling consistently got stronger and stronger. Whatever it was it was getting closer and closer, and just as I realized what was causing this pulling……..I saw HIM. It was Jesus! He walked closer and closer then HE STOPPED. He had walked right up to me, looked into my eyes, oh the love!! I stood there looking back into His eyes. Soaking up the purest love I have ever felt!!! It consumed me!! Then He turned and began walking towards the two women. Then THEY saw Him.. the one woman began to say, “Why have you been so long? Where have you been? You said you would come, but now its too late!!”. Jesus looked at her lovingly and shook his head and said “oh Mary, Mary!” She then said, “You have waited too long. He is dead. It has been 3 days and now he stinks! It’s too late!” Then Jesus said, “Lazarus come forth!” And Lazarus appeared at the opening of the tomb. The women were amazed and people came running from all around to see. As I stood there watching this, at first I was trying to remember why this looked so familiar. Where did I know this from? Then I remembered my Pastor and our church. I remembered hearing stories from the Bible and this one in particular. I remembered the story of Lazarus . Oh yes!! Jesus answered my question “how long?”and even one I have had for years about this particular story. Why did he wait so long? Both answers helped me understand His reasoning and methods. Here is the answer to why He waited so long to heal Lazarus. Jesus was here to bring Glory to God. Lazarus and this particular group of people were friends and family to Jesus. Had he come earlier, and healed Lazarus when he was sick, since they were all close friends, it could have been said, it was a fraud. A conspiracy! There was no healing! Lazarus faked it! So Jesus waited until there was no doubt. He waited til EVERYONE KNEW LAZARUS WAS DEAD. THEN HE CAME AND GAVE HIM LIFE! GLORY TO GOD! The answer to my question “how long?” is this is what he was doing with me. Waiting until everyone knew that I was dead. I was in a coma. I had no idea what was going on around my body. But Jesus had given me my answer. 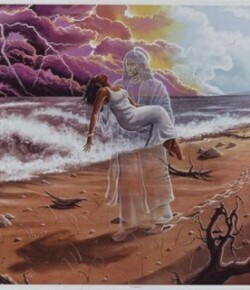 He was in control and was bringing me back, WHEN IT WOULD GLORIFY THE FATHER! I understood and had a feeling of pure peace. I knew I would wait, and willingly, no matter how long it took. It didn’t matter. Once I had my answer, I turned and walked back into the darkness. Stepping up on that cement block step, and into the doorway. I walked to my body, still lying on that bed. I knew that I would be waiting. And the length of time really didn’t matter. Jesus was in total control. That’s all I needed to know. I remember thinking that I didn’t care how long I had to wait, even 100 years. I’d wait. Because I completely trust in Jesus. And I truly meant it. I climbed back into my flesh body and that’s where my memory of this event ends. I want to re-emphasize this, about that place with Jesus. There was no fear. Only peace. This is very hard to describe. It is the most memorable thing about that entire event. I was not in my earthly body. I could tell when I was back in it because fear is so much a part of us that we don’t even know its there. This world teaches us through fear. This is the method by which we learn. For instance, as a baby we learn not to touch a hot stove, if we touch it again, we will get burned. WE call it common sense but in reality it is fear. Our learning is fear based. Anxiety, depression, anger, hostility, even shyness are all fear based reactions. I HAVE BEEN WHERE THERE IS NO FEAR. I am not saying that I was in heaven. But I will say that if all that heaven has to offer is that there is no fear, I am good with that for eternity. It is that much better than anything this world has to offer! I have been told that the team of doctors I had, told my family that there was no hope. I was dead and not coming back. All of the technology they had, confirmed that I was dead. My family wouldn’t accept this. The doctors said, Even if by some miracle, I did come out of the coma, I would have severe brain damage and would need extensive rehabilitation. I would not recognize my family and would not be able to walk or talk and would have to learn, all over again the most basic things. The doctors explained I had been without any brain activity. I was dead. They were waiting for my youngest daughter to arrive. She was several hours away and due to car problems, couldn’t get there. My good friend, Alan drove to get her. Once they arrived, They told my family to begin the funeral arrangements. They would remove the life support and they needed to prepare themselves. The news was given to friends and family. However, my boyfriend and my mom, Alan and my youngest daughter refused to give up. They decided that they would believe God and not the doctors. My boyfriend asked my mom if she was willing to stand on the word of God with him, and she agreed. Prayers continued to be prayed for me all over the world. Alan and my mom prayed over me at my bedside, when they were removing me from life support. As they removed the life support, My daughter has told me that there was no brain activity. My youngest son (who had been praying) came to the doorway of my room and spoke to me, and the machine showed drastic movement and began to indicate brain activity. She tried it herself, whispered in my ear and my monitor showed something….. the nuerologist said it was just normal electrical activity, I was dead and it was common. Once a person is dead, the brain can still exhibit some electrical impulses or activity. It was completely normal and not to get their hopes up. He also told them that they really wouldn’t want me to come back with all the damage that was done. I would not know them and may never know them. My family said no it wasn’t just electrical impulses from a dead brain. My youngest daughter told the doctors, “You don’t know our God”!! Once the doctors admitted defeat, God moved. The 3rd day was a friday. As they took me off life support, God moved…I began to come out of the coma. Slowly…… At first everyone was in shock. Especially the Doctors. The nuerologist met with my family and told them I would definitely have extensive brain damage and have to be in a nursing home to rehabilitate, most likely I would not recover. I probably would not know any of them and would have to learn to walk and talk etc all over again….. The more I recovered, the more everyone could see, that I had NO brain damage. The doctors told my family that I was a miracle, and that they wanted to make this clear. They had nothing to do with what was happening! That THIS HAD COME FROM A HIGHER POWER!!! Imagine the doctors actually said that!!! And they should know!! They had confirmed my dead with some of the most technologically advanced equipment available!! Each day, the nurses came in and asked me questions and I answered them. They would look at me in amazement. They would ask me to do things, like touch my nose with my forefinger, or touch my fingers to my thumb, etc. again the look of amazement when I did these things with no problems. I was eating and drinking, and even walking after a few days. One day they had me using a walker and the very next day I was using a cane. Again, looks of amazement from the staff. As I got better and stronger, my family was told a nursing home was not necessary. Each time they said I would not be able to do something or would have to learn it again, God moved and proved them wrong. Since there had been extensive and very serious damage to my heart, I was placed on the heart transplant list to wait for a new heart. God had other plans. I think I was on that list for around 3 days or so? As I got stronger, it was apparent I no longer qualified for nor did I need, a transplant. I was removed from the list. Tests have been done, to determine why I had the heart attack, and the only thing they could find was my heart was enlarged. My cholesterol was “excellent” (their words) I had no clogged arteries or blockages, and no high blood pressure. No reason for the heart attack. Well I call it a heart attack. My doctor corrected me I didn’t have a heart attack. I had heart failure. My heart just stopped. But I still say heart attack so most will understand what I’m talking about. They did the test 3 times. It averaged 43%!! I was not only better than they had hoped but had my heart actually healed? My doctors have not really had much direct contact with me. In the hospital they would come to see me and stand in amazed awe when they saw my progress. When I would ask if I would be allowed to do something this was how they would respond. “Have you tried to do it? (what ever it was I was asking) and I would say yes, and they would say, “then I guess you can!” They have never restricted me from trying anything. They have said that I will know if I can’t do something and then I just shouldn’t do it. When I asked if I could return to work, my Doctor’s face actually glowed and he smiled and said “YES!! !” Before I ever got the entire question out of my mouth! We talked about it and he said I could go back when I felt I was ready. In about two weeks, I decided to try to go back July 9th of this year. (2012). My work allowed me to come back part time for two weeks and then back to full time. I have been back to work for a little over a month now. I am doing great and feeling fine! God is good. When I went back to work I found out that someone had printed off a copy of my testimony that I had posted on facebook. People that I never would have thought would even read it, were very touched by it. I have been asked by a friend to speak at a womens retreat this saturday. I gave my number to a friend whose pastor read my testimony and is planning on asking me to speak at their church soon. I am not worthy of this honor. But I know that God has a plan and it is to Glorify Him and bring his people closer to HIM. So I want to be like Mary, mother of Jesus. Not my will by His will be done. Do with me what you will, Father. Just let me be closer to you. I have many dear friends who are faithful believers in Christ. If it had not been for one of them, my own daughter would not have been able to be with me since she lived so very far away and had no transportation when this happened. I am deeply grateful to him for all he has unselfishly done. I remember this man unselfishly driving 2 or more hours one way to pick my daughter up and take her back home, Not once but several times. He has been a faithful family friend that I am truly grateful for. He also prayed for me and with my mom during all of this. Truly a man of God. Thank you Alan. And many others who unselfishly prayed and visited. Literally, so many I cannot name them all. It has now been 1 year and 5 months since the heart attaack. I have had my regular check up and my ejection fraction is now at 50% and my heart medication has been cut in half. So am I still healing and getting stronger? You be the judge. I am doing more now, that last year. I am back at work and doing great. By the way, did I mention I work in corrections? At a local jail? yeah, God isn’t done with me yet, lots of work to do there….. HIS WORK. As of 2017 ( 5 years have passed) my “ejection fraction” or strength of heart squeeze has increased to what is considered normal (60%). My meds (the two I still take) have been reduced to the lowest doses possible and then cut in half. 2018….. ( 6 years have passed) My ICD device, pacemaker defibrillator, has been removed I now have just a pacemaker. Isn’t our God a good, loving Father?? God is faithful and merciful. I have no memory of the heart attack or even most of the first week of my stay in the hospital! I am told I talked to people but I don’t remember. I have only hope for the future and joy that I have been given another chance. But most of all, that God used me, to bring Him Glory! I am not worthy,or deserving of this honor, but then, its not about me is it?